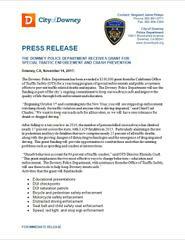 The Downey Police Department has been awarded a $330,000 grant from the California Office of Traffic Safety (OTS) for a year-long program of special enforcements and public awareness efforts to prevent traffic related deaths and injuries. The Downey Police Department will use the funding as part of the city’s ongoing commitment to keep our roadways safe and improve the quality of life through both enforcement and education. After falling to a ten year low in 2010, the number of persons killed on roadways has climbed nearly 17 percent across the state, with 3,429 fatalities in 2015. Particularly alarming is the rise in pedestrian and bicycle fatalities that now comprise nearly 25 percent of all traffic deaths, along with the growing dangers of distracting technologies and the emergence of drug-impaired driving. This grant funding will provide opportunities to combat these and other devastating problems such as speeding and crashes at intersections. 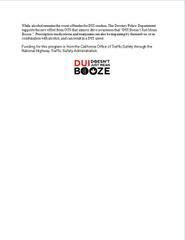 While alcohol remains the worst offender for DUI crashes, The Downey Police Department supports the new effort from OTS that aims to drive awareness that “DUI Doesn’t Just Mean Booze.” Prescription medications and marijuana can also be impairing by themselves, or in combination with alcohol, and can result in a DUI arrest.